Home /Fashion/How to Make Your Outfit Standout This Diwali! Wearing those anarkalis and shining suits every year on Diwali is getting boring. This Diwali every girl is looking for something inventive and contemporary for making this festive season sprightlier. But, with all the traditional dresses around us, we get even more confused and end up purchasing the same type of designs every time. Don’t worry; I am here to help you this time with all the creative ideas. First of all, you need to get rid of Red and try trendy Pastel this Diwali. 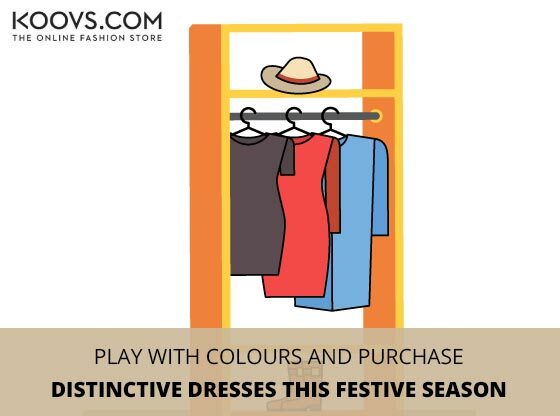 With Koovs coupons, you can play with colors and purchase a distinctive dress that will spruce up your style in seconds. Black color has a charm which mesmerizes everyone and makes the wearer the star of the party in no time. If you ask me, then I would suggest the deadly combo of Black and Cream. Full-length frock dress would do the job perfectly while letting you showcase both traditional and modern dressing panaches. You can explore the evening dresses collection at Koovs to find the perfect fit for you. For discounts, you can even use Koovs coupons available at TalkCharge. Yellow is the colour of happiness and it cheers even the onlookers with its brightness and vibrancy. This colour assures to bring out the elegant lady in you like nothing else. You can definitely find something inimitable in yellow that will let you shine bright like a Sunflower. I just checked out a lovely skirt in yellow at Koovs that can be a quintessential fit for the festive season. While buying, you can apply the Koovs coupon code for more savings. Diwali is the festivals of light and colours and to complement this day you have the option to choose more and more colours. A peplum top or blouse with a skirt would help you transform yourself into a complete fashionista. If you choose an off-shoulder peplum blouse, try embracing it with a gorgeous neck piece. You can play with your hair too while creating a ruffled look. Imagine yourself looking like a doll; it would be a visual treat for everyone. I am talking about a netted skirt or lehenga with a sober blouse. This outfit would be traditional and modern at the same time. If you are not a fan of lehengas, then balloon skirts can be a good alternative. For hairstyle, I would suggest you a bun graced with flowers. Keep the makeup subtle and soft, so that you can showcase your sophistication through your outfit. At Koovs, you can find many great designer blouses at an amazing price. Also, with Koovs coupon on code at TalkCharge you can save more while shopping. If too many bright colours don’t suit your personality, then long kurtas over skirts in pastel shades could be the one for you. You can go for kurtas with closed collars that will spare you of any heavy neck pieces. Make a puff and put a bright orange lipstick with this outfit to make it even more stunning. So, this was all from my side, if you have any other ideas, then feel free to mention in the comments below. The collection at Koovs would help you find a suitable dress for this festival season; don’t forget to add the Koovs coupon code for more discounts. What you Should Eat To Loose Weight?